Are you confused? Yes, this site is about home budgets. So how does a page about an online computer course fit into THAT theme? Well, one of the ways to make your budget work--to create a surplus--is to increase income. Combine extra income with reduced expenses and you essentially double or triple or quadruple your ability to pay down debt, save, invest or buy whatever it is you really want or need. So when SiteBuildIt! (or SBI! ), which I use to build and maintain my websites, recently introduced a 12-week online computer course that enables regular folks with zero technical knowledge or experience to build an income-generating website, I felt very strongly that this was something I needed to present to my loyal budget site visitors. In light of today's economy I think it's critical to explore options that will help you develop some financial independence. An online computer course is a terrific, cost-effective way to make the best use of your free time to get a business going. And don't forget the absolute #1 benefit to an online business: you can leverage your time a lot better by generating passive income. What's passive income? It simply means your income isn't tied to how many hours you work. You can create a website that will earn sales while you sleep, or while you're on vaction, or while you're working your full-time job. Passive income is amazing. Once you've tasted it, you'll never want to go back to a regular per-hour job. The possibilities are really endless. It's an all-in-one solution for someone who wants to build an online business: hosting, research, building, blogging, e-zines, statistics, e-commerce, continued training, active support from fellow users via forums, terrific corporate support, and much, much more. With SBI!, you can create a Web site on your own regardless of technical knowledge and experience. Really. More than 40,000 entrepreneurs have followed Site Build It! 's step-by-step process to build Web sites on their own. Why Did SBI! Develop An Online Computer Course? 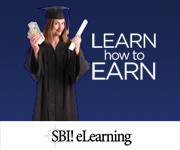 Before eLearning was launched, new SBI! users would learn how to set up their businesses and websites by reading a manual called the "Action Guide", essentially a 10-step business course. I still follow mine religiously and have gone through several copies in my three-ring binder. Within the last couple years, the SBI! 10-step course began going live at various colleges and universities around the world, including schools like The Citadel and Penn State. SBI! users became instructors and taught the course as part of the schools' entrepeneur and business programs. Drawing on that live classroom experience, Sitesell (the company behind SBI!) decided to introduce a virtual 12-week online computer course than anyone from any part of the world could take, at any time. The growth of distance learning has proved that many folks prefer to learn online. E-learning teaches you how to build a website (and online business), step-by-step. If you're a type-A personality, this will appeal to you as well. E-learning lets you study at a steady pace through the guidance of an experienced SBI! owner, as well as from your fellow classmates as they share their experiences and tips. Frankly, not all college professors can say they've "been there and done that". E-learning lets you learn on your own schedule in your own home. All you need is about an average of an hour a day. E-learning offers a money-back guarantee, something you definitely won't find at most educational institutions. E-learning has a temporary, introductory $200 rebate offer. Save money! First, you watch a video to study the current week's lesson. An interactive quiz makes sure you understand the material. After doing your prep work, you'll meet 90 minutes a week for 12 weeks with your instructor and classmates using a virtual blackboard, free telephone conference call, and real-time chat. Each class is limited to just 12 students to ensure personal attention. As you learn, you actually build your site. When you graduate at the end of 12 weeks, you will have a fully-functioning website and internet business! For a complete list of what's covered in each of the 12 weeks, visit the SBI! eLearning page. Here's one of the things I love about SBI!. They have a toll-free number where you can call and ask any question you want. Guess who answers the phone? Not a salesperson. Instead, you get a real-life SBI! owner who just loves it so much (like me), they're willing to answer questions from folks like you they may be wondering whether it's really worth the time and effort. Give the number a call and get your questions answered. There's not really much else I can say--I just recommend SBI! and its new eLearning so highly, all I can do is encourage you to sign up today. Remember, they're limited to a size of 12 students per class. If you do take the online computer course and start an SBI! business like me, please drop me a line and let me know what you're doing, so I can check out your site!